Release Date: Apr This is a remarkably unique exploration game, in which we embark on a journey through the desert sands. It was originally on PS3 in 2012 and won several Game of the Year awards. Our goal is to reach the summit of a great mountain, constantly visible on the horizon. It's an intriguing adventure platformer from a developer known pretty well by all fans of ambitious and unusual games which has created several renowned titles, such as flOw and Flower. The game does not force anything and allows the player to discover the secrets of the universe, which once was the home of an advanced, powerful civilization, in their own pace. The adventure begins by giving the player their destination – a great mountain, constantly visible on the horizon. From that moment the person wielding the gamepad must demonstrate their cunning, curiosity and ingenuity to get through the desert. The game features semi-open levels, which contain numerous puzzles, hidden objects and story fragments. After passing each of the levels we will advance to the next stage. The various "sections" of the expedition are enriched by several mysterious cutscenes. Given time the player will begin to understand what exactly he is dealing with, however, it is up to you to discover and interpret the explanation. It surprises us not only with mysteries and intense music. If during our adventures we decide to play in the online mode, we can encounter other players during our trek. 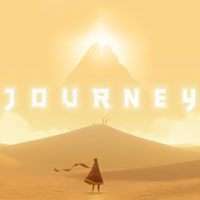 Journey automatically connects players into pairs and gives them the simplest form of communication - a musical chime. The developers wanted to free the cooperative gameplay from the typical problems of contemporary games – making sure the experience is completely non-invasive.